If you’re making candles for Christmas gifts, embellish them by embedding decorative items. You’ve likely seen a candle that has some object lodged inside it, such as shells or wax chunks. 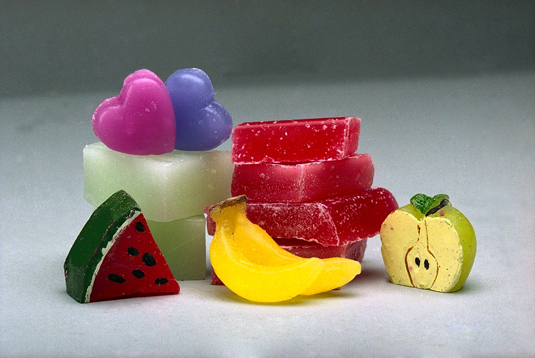 Gel candles, in particular, are known for their seascape and fruit effects. But paraffin wax can spotlight objects like shells, marbles, and flowers just as well as gel can. Fortunately, this classy little embellishment is an easy effect to achieve. Wax chunks come in all shapes and colors and ready for embedding. If an item burns outside a candle, it will burn inside your candle as well; nonflammable items are best. Objects can cause bubbles in your candles, so if you want to avoid bubbles, consider warming your container prior to pouring and then pour your wax as slowly as possible. You can see your gel candle embedments clearly; paraffin wax gives you a little more room for error. Don’t place an object too close to the wick, which may extinguish when it reaches that point. Place your embedment at the bottom of your container and then add your wax: Use this technique mostly for gel candles. After you add your wax, make the candle as you normally would, taking care to remove bubbles. If you’re using a heavy embedment, you don’t need to glue it down. 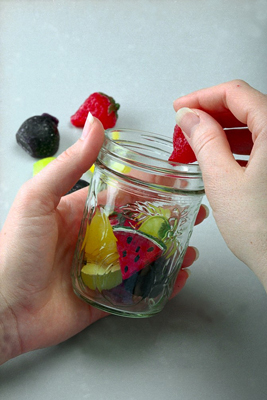 Otherwise, if you’re making a container candle, you can use fast-setting epoxy glue, available at most stores, which also helps place items at various heights. Just place a little glue on the bottom of your object, and then press it down on the bottom of your container. To make a gel candle, add your embedments first, using glue if necessary, and then pour your wax. Add your wax and then add your embedment: Make your candle, but instead of allowing it to cool completely, wait until you see a 1/2-inch thick film on top, which takes about 10 minutes. Cut a hole in the wax. Using a spoon, return the soft wax in the center to your melting pot, and then add your embedments where you want them; for example, place them into the soft wax on the sides on the candle. Remelt the wax and pour it back into the hole. Your embedment appears to float within the candle. You can also embed objects by making a core candle. You then place that candle into a larger mold and fill the perimeter with your items. You then pour wax into the mold. Dried flowers, spices, and other typically flammable materials are fine to use with this method because the wick is sized for the diameter of the core candle and, ideally, shouldn’t extend out to the objects.